Chelsea boss Maurizio Sarri has reportedly urged the club's hierarchy to pursue a move for Cagliari's Nicolo Barella when the transfer window reopens next month. The 21-year-old is regarded as one of the top prospects in the Italian top-flight and he was linked with a potential switch to Tottenham Hotspur during the previous transfer window. According to L'Uniuone Sard, both Sarri and his assistant Gianfranco Zola are big admirers of the one-time Italy international and they have supposedly urged the board to make an approach for the midfielder. 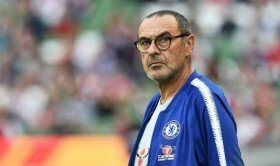 Chelsea are presently filled with numerous options at the heart of the midfield but Sarri nonetheless appears keen on recruiting another player of his own after the success brought about by Jorginho's signing. Should a new midfielder arrive, Danny Drinkwater appears the most likely to part ways with the Blues after failing to make a single appearance for the club since the Community Shield game.